Bliss case erectors or bliss box case erectors are designed to erect bliss boxes or bliss cases. Bliss boxes are made from a solid bottom piece that is folded to form two sides, and two additional pieces, which are inserted into the box and attached to the solid bottom piece to form the other two sides. The addition two pieces to form the additional sides of the bliss box are glued into the inside of the solid bottom piece using hot melt glue. Because of the solid bottom piece, bliss box erectors create a case that only has top flats to close and seal once the case has been filled. SWF Model 1D6A, automatic, hot melt glue, bliss box former rated from 12 to 35 cases per minute – depending on material and application. Bliss size range: 9-1/4" to 31-7/8" in Length x 8" to 20" in Width x 4" to 16" in Height. Equipped with 27" long blank case and (2) 25" long side feed blank magazines with 6-cup cam operated vacuum pick and place, (2) SWF hot melt glue pots, and 25" high discharge with status indicator light, (2) temperature and (2) adhesive pot temperature controllers. Mounted on heavy duty base frame. W E Plemens Model Bliss, automatic, bliss box former, hot melt glue sealer rated from 10 to 35 boxes per minute – depending on material and application. Case size range: 9-1/4" to 31-7/8" in Length; 8" to 20" in Width; 4" to16" in Height. Equipped with 36" long top blank case magazine, 4 vacuum suction cup recipercating pick n place, center guide roller, (2) 48" long side blank feed magazine, forming mandrel (2) gun hot melt glue system. Control panel has hand, auto, run, jog, auto, off on / off switches with start / stop push buttons and statis light bar. Mounted on heavy duty base frame with safety guarding. SWF, Model BF 400VK, automatic, 3-piece bliss case former and hot melt glue sealer. Rated from 12 to 35 cases per minute – depending on material, application and machine configuration. Bliss case size range: 9¼" to 32½" in Length; 9" to 18" in Width; 4" to 16" in Height. Equipped with 146" long powered top blank magazine and (2) 46" long side blank magazines, (4) suction cup vacuum pic n place, single friction feed wheel, Nordson hot melt glue unit with pattern control and vacuum system. Control panel has A/B controller with run / jog, manual / auto and vacuum on / off switches, start / e-stop buttons and cage style safety guarding with statis light bars. Mounted on heavy duty base frame. Moen Model PF106HL, automatic, vertical, corrugated "H" style partition inserter capable of speeds from 10 to 45 inserts cases per minute – speeds depending on material and application. 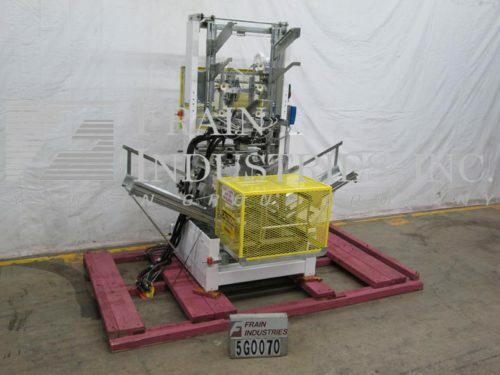 Can run in conjunction with standard "RSC" case or "H" style bliss box formers with cases from min / max range of: 10" – 24" L x 10" – 16" W x 7" – 15" D. Equipped with a 36" x 48" blank insert magazine, (3) wheel feed system, pneumatic pusher arm and a die compression section with ram arm, and 4 sided forming insertion station. Moen M3-A (2) gun H/M glue system, control panel, with on / off feed wheel, "H" feed, and die compress controls. SWF Model BF400V, 3-piece hot melt glue bliss case former with number of cases per minute – depending on materials and application. Case Size Range: 9-1/4" to 35-7/8" in Length; 8" to 20" in Width; 4" to 16" in Height. Equipped with 24" top blank magazine and two 48" long side blank magazines, (6) suction cup vacuum pic n place, single friction feed wheel, Nordson hot melt glue unit and vacuum system. Control panel has A/B controller with touch pad controls and panel view, vari speed controllers, with run / jog, manual / auto and vacuum on / off switches, start / e-stop buttons and cage style safety guarding with status light bars. Mounted on heavy duty painted base frame. SWF, Model 1D5AK, automatic, 3-piece bliss case former, hot melt glue sealer, rated from 12 to 35 cases per minute – depending on material and application. Bliss box size range: 9¼" to 31-(7/8)" in Length; 8" to 20" in Width; 4" to16" in Height. Equipped with 18" long blank case magazine, (2) adjustable 45" long side bliss end magazines, (6) suction cup vacuum pic n place, single friction feed wheel, internal flange closer, Nordson hot melt glue system with pattern controller and integrated vacuum system. Control panel has run / jog, manual / auto and vacuum on / off switches with start / e-stop buttons. Mounted on base frame with cage style safety guarding. SWF, Model 1D5A, automatic hot melt glue 3-piece bliss case former rated from 12 to 35 cases per minute – depending on materials, application, environment and machine configuration. Bliss box size range: 9¼" to 31-7/8" in Length; 8" to 20" in Width; 4" to 16" in Height, with proper change parts. Equipped with 24" long blank case and (2) adjustable 36" long bliss end magazines. (6) suction cup vacuum pic n place, single friction feed wheel, internal flange closer, mechanical hot glue pots with temperture control dials for glue pots/pumps and integrated vacuum system. Control panel with run / jog, manual / auto and vacuum on / off switches with start / e-stop buttons and mounted on standard base frame with cage style safety guarding. Moen Model PF106HLV, automatic, vertical, "H" style bliss former rated from 10 to 23 cases per minute – depending on material and application. Can run in conjunction with standard "RSC" case or "H" style bliss box formers. Case size range: 9" to 25" in Length; 8" to 25" in Width; 4" to 16" in Depth. Equipped with 48" long x 24" wide blank body wrap magazine with (6) suction cup pic n place, 72" long x 24" wide blank insert magazine, with (3) wheel feed system, die compression section, (4) sided forming station, pneumatic single ram arm, Nordson hot melt glue system with 42" long case discharge conveyor. Control panel has A/B controller and touch pad controls with start, stop, e-stop, safety guarding and statis light bar. SWF Model 1D5AK, automatic, hot melt glue, 3-piece bliss case former rated from 12 to 35 cases per minute – depending on material and application. Bliss box size range: 9-1/4" to 31-7/8" in Length; 8" to 20" in Width; 4" to 16" in Height. Equipped with 24" long blank case and (2) adjustable 24" long bliss end magazines. 6 suction cup vacuum pic n place, single friction feed wheel, internal flange closer, mechanical hot glue pots with temperture control dials from 200 to 550 Deg F and integrated vacuum system. Control panel with run / jog, manual / auto and vacuum on / off switches with start / e-stop buttons and mounted on standard base frame with cage style safety guarding. SWF Model 1D5AK, automatic, hot melt glue, 3-piece bliss case former rated from 12 to 35 cases per minute – depending on material and application. Bliss box size range: 9-1/4" to 31-7/8" in Length; 8" to 20" in Width; 4" to 16" in Height. Equipped with 24" long blank case and (2) adjustable 24" long bliss end magazines. 6 suction cup vacuum pic n place, dual friction feed wheels, internal flange closer, mechanical hot glue pots with temperture control and integrated vacuum system. Control panel with run / jog, manual / auto and vacuum on / off switches with start / e-stop buttons. Mounted on heavy duty frame. SWF Model 1D5A, automatic, hot melt glue, 3-piece bliss case former and sealer rated from 12 to 35 cases per minute – depending on material and application. Bliss case size range: 9-1/4" to 31-7/8" in Length; 8" to 20" in Width; 4" to 16" in Height. Equipped with 24" long top blank case and (2) 44" long side blank magazines. 6 suction cup vacuum pic n place, with single friction feed wheel, internal flange closer, hot melt glue and vacuum systems. Control panel has push button controller with readout and run / jog, manual / auto and vacuum on / off switches, start / e-stop buttons with safety and statis light bars, Mounted on base frame with cage style safety guarding.